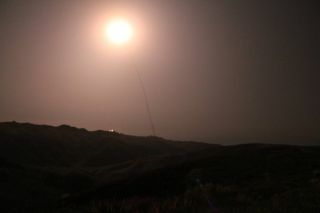 A Minotaur 4 rocket launches the new Space-Based Surveillance Satellite for the U.S. Air Force from Vandenberg Air Force Base in California on Sept. 26, 2010. This view was taken from a peak near the launch pad. Thisstory was updated at 2:40 a.m. ET. TheU.S. Air Force lit up the night sky above California Saturday (Sept. 25) withthe launch a new satellite sentinel to keep tabs on other spacecraft and thegrowing problem of space junk around Earth. TheSpace-BasedSpace Surveillance satellite, called SBSS, will monitor the orbitalenvironment as part of the U.S. military's evolving Space Surveillance Network. Thesatellite is essential to keep U.S. space assets safer and more secure, as wellas "keeping America at the forefront of space," Jordan added. Theoverall cost of the SBSS program is about $858 million, Air Force officialshave said. Thereare about 500,000 known piecesof space junk orbiting around our planet. Of those, about 21,000 objectsare larger than 4 inches (10.1 cm) in diameter, and are being tracked by theDepartment of Defense, as part of the Space Surveillance Network. These areitems like spent rocket stages and broken satellites. The2,277-pound (1,031-kg) SBSS satellite was launched on a Minotaur4 rocket, which was designed by the Virginia-based Orbital Sciences Corp.It was the first time a Minotaur 4 booster has been used to launch a satelliteinto space. TheMinotaur 4 rocket is a four-stage booster with three stages built using retiredPeacekeeper missile motors and a commercial fourth stage developed by OrbitalSciences. The rocket can launch payloads weighing nearly 2 tons into orbit. Itmade its first test flight in April. TheSBSS satellite is about the size of a small car, Air Force officials said. Itis designed to track space debris and satellites from an orbit about 392 miles(630 km) above Earth. "SBSS will greatly enhance our existingspace situational awareness capability, a capability vital to protecting ourspace-based assets," said Col. Richard Boltz, commander of the 30th SpaceWing at Vandenberg Air Force Base. Boltz added that Saturday night's launch wasthe third in eight days for Vandenberg's launch team. Aerospaceheavyweight Boeing is responsible for the overall SBSS program management. TheColorado-based Ball Aerospace & Technologies Corp. developed, designed,manufactured and tested the satellite, using the Boeing-built onboard missiondata processor. Thespacecraft is equipped with a visible sensor mounted on an agile, two-axisgimbal. This device will give ground controllers the flexibility to quicklymove the camera between targets without needing to reposition the satelliteitself or expend additional fuel. "Thatgimbal is able to quickly move to detect events in space," said ToddCitron, director of the Boeing Advanced Space and Intelligence Systems. "The agility contributes significantly to the advantages of the SBSS toprovide space situational awareness." Thesatellite will collect data to be used in conjunction with observations fromground-based radars and telescopes. TheSBSS satellite was originally scheduled to launch in Oct. 2009 but was delayeddue to technical concerns with its rocket launch vehicle. Saturday'sliftoff was the second of three Minotaur 4 rocket launches planned for thisyear. The next flight is slated to launch Nov. 19 carrying several satellitesfor the Air Force's Space Test Program.